Our A100 Series Anemometers are robustly constructed using weather resisting plastics, anodised aluminium and stainless steels enabling them to withstand continuous exposure to the weather, including marine environments, making them suitable for a wide range of applications where accuracy and sensitivity are important. The A100 series anemometers all share the same basic construction and use the same R30 series 3-cup Rotors. Different internal modules and components are used to provide various output signals. The use of a precision ball-race mounted shaft ensures the essential low threshold speed and good repeatability. The outline and mechanical design, common to all the A100 series, remains largely unchanged since the introduction of the original Porton™ Anemometer in 1972, the electronics modules being continuously developed during this time to provide a well tried, durable and reliable product. Anemometers have, until recent years, only been calibrated/evaluated in wind tunnels. Investigation by the wind power industry has found that various anemometer designs behave differently in field conditions where there is considerable turbulence. The Vector Instruments A100 design is one of a very few which has been subjected to field trials, and these have shown that Vector Instruments' A100L2, A100LK, A100K and A100LM anemometers (using the R30/K2, R30/K and R30/M3 rotors) are amongst the very few cup anemometer designs which can be classified as having "First Class" performance according to the requirements of the IEC61400-12-1 when suitably sited and operated. This high performance classification means that measurements are accurate in the actual wind conditions experienced in the field (as opposed to just being accurate in the artificial conditions of a low-turbulence wind tunnel) making them the clear choice for wind assessment applications. In operation, the wind causes the rotor to rotate at a speed proportional to the wind speed. This rotation is sensed in our optoelectronic anemometers using a slotted disk and an optical beam. In the case of the switching anemometer the rotation is sensed using a balanced system of magnets and a reed-switch. Options common to all the anemometers include anti-icing heaters, marine versions/rotors and mounting adaptors and anti-surge protection. Anemometers for Wind Turbine Testing and Wind Farm Site Assessment. additional information regarding obtaining the highest accuracy measurements with our instruments. MEASNET calibrations and IEC classification/standards. What is the A100R/K variant and why/when should it be used? What is the "K" in A100R/K for? Note: New A100R models no-longer contain any mercury and are now RoHS2 compliant - they now use a "dry" reed-switch instead of the older mercury-wetted type - see the A100R page for details. Vector Instruments' A100 Series Anemometers are among the very few available having Class 1 performance ("First Class") according to the requirements of IEC and MEASNET standards. Unlike some other manufacturers, we do not manufacture a "combined" wind speed and wind direction sensor. 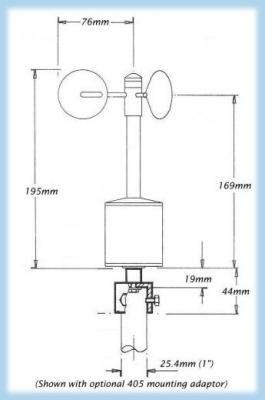 With our product range you have the flexibility to chose an anemometer and windvane with appropriate output signals and mount them together at the top of a mast using one our 405-1 series mounting arms. We do not manufacture "generator" type anemometers either, nor do we manufacture equipment for generating power from the wind (although our anemometers are commonly used for surveying and evaluating the suitability of a site for wind power generation). Page Rendered in: 0.355280 seconds. - Powered by Mambo.